During a busy morning, the last thing you may want to do is stop and pack lunches for your kids. Thankfully, these meals come together in just 10 minutes, making it easier for you to get moving again as quickly as possible. To save even more time, pack these delicious lunches in a bento lunch box from Kangovou, a bento lunch box company dedicated to making your meals easier and safer. There’s no cooking necessary for this green machine of a lunch. 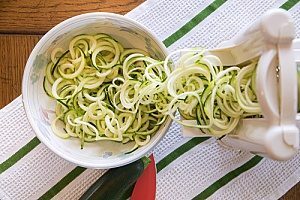 Zucchini can become a healthy substitute for noodles in just seconds thanks to a spiralizer. Blend kale, olive oil, basil leaves, salt, pepper, garlic, lemon juice, and slivered almonds in a food processor for a fresh sauce. Mix it all together, and lunch is a go. Add in some sliced tomatoes or other veggies for some variety if you have a few extra minutes. Trade the bread for big, leafy lettuce to make these lettuce cups. You can use leftover chicken from last night’s dinner or buy a ready-made rotisserie chicken, then combine with thinly sliced veggies and a sauce of your choice, like a simple lemon and olive oil mix. Lettuce cups are a fun lunch that provides plenty of nutrition while keeping things interesting for your kids. Frozen veggies and pre-cooked rice are the time saving heroes of this meal. Premade rice has the right amount of crunch and separation for a delicious fried rice, while frozen veggies often retain more nutrients and make your meals better. Instead of fresh ginger, many supermarkets sell frozen cubes of pureed ginger, making this fried rice even faster. Add in leftover chicken or other proteins for a full meal. Cold pizza makes the best breakfast, so why not send a healthier version for lunch? Portobello mushroom caps make nutritious crusts that can be topped with tomato sauce, cheese, sliced pepperoni, bell peppers, and anything else you can get to fit. This recipe doesn’t even require preheating the oven — just assemble your pizzas and pop them into the toaster oven while you finish getting ready, and they’ll be ready in time to head out the door. 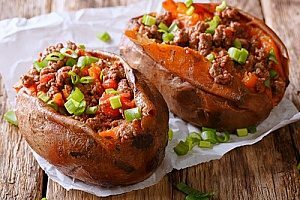 Growing kids get a boost of protein and healthy fats with these stuffed sweet potatoes. They’re filled with eggs and avocado, then topped with salsa, greek yogurt, and whatever spices sound yummy. Add some sliced fruit on the side for something sweet to balance out this savory powerhouse. Ground beef cooks up quickly, and you can easily slice up the veggies you’ll need for this salad while it does. Taco salads are great way to give your kids a big dose of protein and nutrient rich veggies without relying on tortillas to deliver it. Make the matching taco-seasoned dressing, or keep things simple with a serving of salsa. This versatile salad can easily be adapted to whatever is in your kitchen. Start with a base of chickpeas and chopped cucumbers, served with a side of hummus and bell peppers for dipping. The salad can be dressed up with anything from grape tomatoes, basil, and mozzarella balls for an Italian spin, or baby spinach and chicken for something heartier. Jarred curry sauces make quick work of leftover veggies and chicken. Frozen would work just as well, but the preparation is the same. Throw everything into a pot and simmer long enough to heat and coat your ingredients, then pack your deliciously simple curry with rice for a filling meal that takes no time at all to prepare. Face it, you probably wanted a Lunchable every so often when you were a kid, too! Instead of serving up a processed package, make your own in just a few minutes. Sliced salami or ham, cheese, and whole grain crackers provide a healthy alternative. Add carrot sticks, snow peas, or sliced fruit on the side to round things out. 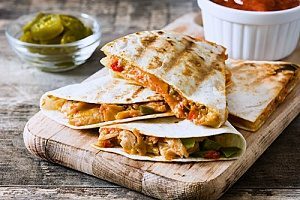 These quesadillas are a sneaky way to add more veggies to your kids’ lunches. Use whole-grain tortillas and stuff them with black beans, tomatoes, spinach, and whatever else you have on hand that might appeal to your child’s taste buds. They cook up quickly in the morning but can also be made the day before and quickly reheated on the stove or in the microwave before being packed up for lunch. Bento lunch boxes can be huge time savers during busy mornings. Instead of searching for multiple containers and lids, you can pack a full meal in one box thanks to the sliding divider in a bento lunch box compartment. They also save space and allow you and your kids to replace all of those containers with one simple and safe bento lunch box. Kangovou’s bento lunch boxes are made of BPA-free plastic and stainless steel, keeping your food safe from chemicals and at the proper temperature until lunchtime. Learn more about bento lunch boxes at Kangovou.com.